Tony Eastman's 'Shoes for a dancing robot', made from Olive oil tins, brass, wood and leather, are an example of humour within art. 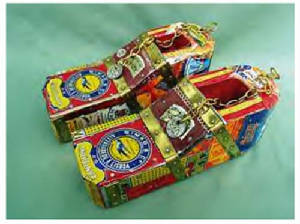 The 'shoes' are lined with leather as if to be worn- if your feet were small enough to fit inside. The 'Shoes for a dancing robot' come with their own shoebox stating that "one size fits all". The title itself evokes comic imagery, making the audience consider the awkwardness and noise of a dancing robot.